The preservation of food has always been an important factor for the food industry, and has been in practice since ages. Increasing trade of food products across the globe has led to the increasing demand for food preservatives, thus supporting the growth of bio preservatives. Bio preservatives such as bacteriocins are used to inhibit the growth of harmful microbes in a wide variety of food and beverage products. The preferred use of bacteriocins such as Nisin in these applications is due to their heat-resistant property, since thermal processing is extensively used in food processing. Even at high-temperatures, Nisin and other bacteriocins serve to inhibit the growth of spores and save food products from any kind of spoilage. Apart from Nisin being a heat-resistive preservative, it also acts as a broad spectrum preservative, effective against many gram-positive organisms such as lactic acid bacteria, listeria monocytogenes, staphylococcus aureus, bacillus cereus, and clostridium botulinum, among others, which is expected to drive the growth of the 2018-2026 market over the forecast period. The global nisin market is, however, currently restrained by precised production; as the production process of nisin is highly sensitive and requires a lot of precision. If, by chance, there is any imbalance in the lactate concentration beyond a standard level, and a decrease in the pH level, it can drastically affect the final end product, which is expected to be a significant restraining factor for the growth of the nisin market over the forecast period. 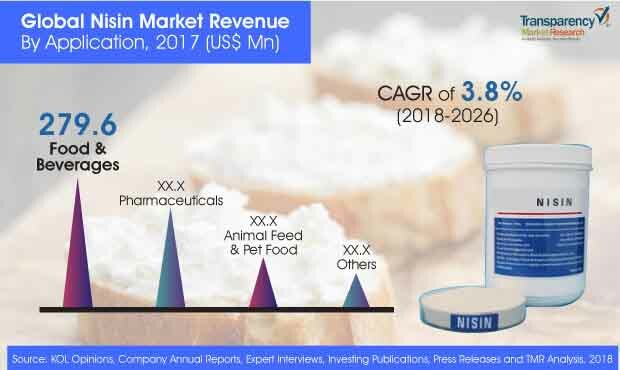 Revenue generated from nisin market is estimated to be valued at roughly US$ 320.6 Mn by the end of 2018 and is expected to increase at a CAGR of 4.2% over the forecast period. Global nisin market are expected to be valued at approximately US$ 445.6 Mn by the end of 2026. The application of bio preservative such as nisin is not limited to food products. It can be applied to wine, beer, distilled spirits, and other alcoholic beverages as well. Nisin helps prevent rancidity caused by lactic acid bacteria in alcoholic beverages. It helps in the inhibition of gram positive bacteria during the fermentation process. Nisin also helps extend the shelf life of non-pasteurized beer, and reduces the ripe taste. All these properties are contributing to the growth of nisin over the forecast period. Moreover, according to the recent past activities in various regions of the world, it can be concluded that, the consumption of alcohol or alcohol-based products has become an accompaniment for a number of reasons, such as celebrations, commiserations, the end of a working day, and others. In many developed regions such as Europe, Canada, and the U.S., alcohol is a socially accepted part of daily life. The younger population of the world is influenced by their peer group or peer thinking, which factor is driving the growth of alcoholic products, hence supporting the growth of the nisin market, which is expected to continue over the forecast period. Although the demand for clean label food products is increasing with robust growth, that in Eastern European countries is expected to be relatively lower. The major two countries in Eastern Europe have a below average disposable income per capita set by OECD (Organisation de Coopération et de Développement Économiques). Clean label food products are priced in the premium range, and low disposable incomes may act as a restraint to products such as clean label food, organic food, and others, and is expected to restrain the demand for food products manufactured with clean label ingredients such as nisin, as their prices are high as compared to conventional products which contain synthetic preservatives. By form, the nisin market is segmented into powder and liquid. The powder segment is likely to be the most attractive segment in the forecast. The powder segment is estimated to account for a significant revenue share of 97.9% in 2018 and is expected to reach 97.7% by 2026. On the basis of end use, the nisin market can be segmented into food & beverages, pharmaceutical, animal feed & pet food and others. The food & beverages segment is further sub segmented into beverages, bakery, confectionary, meat, poultry & seafood, dairy products, ready meals, soups & noodles, snacks and others. The food & beverages segment is estimated to account for a significant revenue share of 90.2% in 2018 and is expected to register moderate growth rate during the forecast period. On the basis of region, the market in the U.S. is expected to dominate over the forecast period followed by Europe. Due to the existence of Chinese players, Asia is expected to become a prominent player by the end of the forecast period with a significant CAGR attributed to increase in the per capita consumption of Nisin in the region. Some of the major companies operating in the global nisin market are Koninklijke DSM NV, E. I. du Pont de Nemours and Company (Danisco A/S), Merck KGaA, Siveele B.V., Santa Cruz Biotechnology, Inc., Galactic S.A., Handary S.A. , Shandong Freda Biotechnology Co., Ltd, MAYASAN Food Industries A.S., Cayman Chemical Company, Inc., and Chihon Biotechnology Co., Ltd. among others. Transparency Market Research offer 8-year forecast for the global nisin market between 2018 and 2026. The global nisin market is expected to register a CAGR of 4.2% during the forecast period. The primary objective of the report is to offer insights on the advancements and opportunity in the nisin market. The study demonstrates market dynamics that are expected to influence the current challenges and future status of the global nisin market over the forecast period. This report also offer updates on trends, drivers, restraints, value forecasts, and opportunities for manufacturers operating in the global and regional nisin market. The demand for clean label food has been witnessing substantial growth, globally, in the past few years. Increasing consumer awareness regarding the health benefits of products containing natural ingredients and strong support from multinational ingredient manufacturing companies for the development of such products are key factors driving the demand for clean label ingredients, such as those produced without the use of any additives, chemicals, and artificial ingredients, and minimally produced. Moreover, consumers are currently more informed regarding the benefits of using natural ingredients through various social media platforms. The popularity of synthetic preservatives is dramatically falling in the recent past. Consumer dissatisfaction with regards to synthetic additives available in the market is prompting food manufacturers towards developing food products with natural preservatives, by replacing preservatives such as benzoates and sorbets with clean label solutions, hence supporting the growth of the nisin market. The report includes market share of each segment according to the region with analysis towards market trends respectively. A section of the report highlights nisin demand. It also provides a market outlook for 2018–2026 and sets the forecast within the context of the nisin ecosystem, including the new product developments as well as product offerings in the global nisin market. This study discusses key trends contributing to growth of the global nisin market, as well as analyses the degree to which drivers are influencing the global market. In the final section of the report, a competitive landscape has been included to provide report audiences with a dashboard view. Detailed profiles of the providers are also included in the scope of the report to evaluate their long-term and short-term strategies, key offerings and recent developments in the nisin space. Key players in the global nisin market includes Koninklijke DSM NV, E. I. du Pont de Nemours and Company (Danisco A/S), Merck KGaA, Siveele B.V., Santa Cruz Biotechnology, Inc., Galactic S.A., Handary S.A. , Shandong Freda Biotechnology Co., Ltd, MAYASAN Food Industries A.S., Cayman Chemical Company, Inc., and Chihon Biotechnology Co., Ltd. among others. Also, another key feature of this report is the analysis of all key segments in terms of absolute dollar. This is traditionally overlooked while forecasting the market. However, absolute dollar opportunity is critical in assessing the level of opportunity that a provider can look to achieve, as well as to identify potential resources from a sales and delivery perspective in the global nisin market.